The Washington is an excellent model for people who are looking into buying their first home or couples who are planning to raise a family. This design has a total area of 2,851 square feet but has a finished square footage of 1,436. It’s constructed to accommodate a large family room, a dining and kitchen area, a quaint entryway, as well as a fireplace and laundry room. 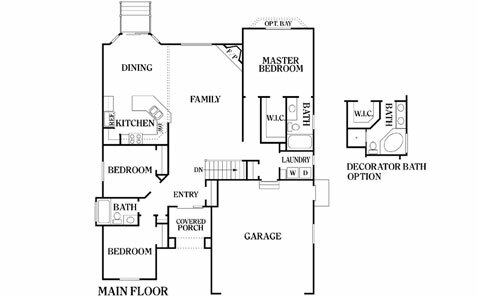 Plus, it boasts 1 shared bathroom, 2 bedrooms, and a spacious master bedroom that has a walk-in closet and master bath. This home also has some room for customization. In particular, the size of the master bath can be made larger than the walk-in closet. You can even add a bay window to help brighten up the room. Furthermore, a formal home office or study can be included in the floor plan if you need a quiet space to finish your work. Perry Homes is your trusted heritage home builder in Utah. We have over 40 years of experience constructing a variety of rambler and two-story homes that suit the budget and needs of many American families. Our philosophy is to provide affordable living spaces that exhibit top-tier construction. What’s more, we’ve created a seamless, stress-free process to ensure that your future home will be up and ready when you need it to be. Contact Perry Homes Utah and let’s start building your dream home today. Our agents will gladly walk you through our process and answer any of your questions regarding our home designs. We can also show you our different financing options to help you get the most out of this deal. Give us a call at 801-264-8800 and our attentive customer service operators will be with you.